I know it was vacation, and I had no logical reason to wake up early, but I still managed to be up and eating breakfast before 8 a.m. on Tuesday morning. What can I say? I'm a morning person that hates change. Originally, all the adults were going to branch off and do their own thing this day. We'd spent all of the previous day together and had nothing reserved that required everyone to stick together. However, we all began chatting about our plans and realized we wanted to see the same things. Well, no point in splitting up then. Might as well remain as a group and get lost in Italy together. 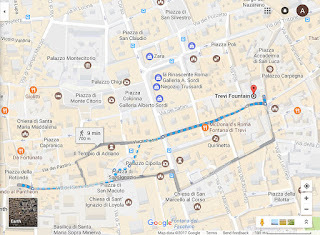 The menfolk pulled up computers and ipads and fiddled around with google maps until they came up with a walking route for us to take. We played Play Doh with Landon and read Evie board books. Oh, and drank cappuccinos from the local cafe. That cost a whopping 2 Euros and tasted like heaven. When a tentative plan had been made, we all made our way through the now-familiar tram ride to a bus stop we needed. Don't ask me which one it was. Can't recall. The thing I do remember is once we got to our destination, Landon shouted out that he'd left some imaginary toy alligator on the bus, and his sweet PaPaw started climbing back on board as the doors were closing. He was going to find his grandson's toy. From the bus stop, it was about a two minute walk to the piazza the Pantheon was housed near. Well, it was probably vice versa. The Pantheon was a tad bit older than the square built around it. It was one heck of a sight and admission to enter was free. Inside, we were all able to see the ellipse in the ceiling and Raphael's tomb. Next after the Pantheon was the Trevi Fountain. 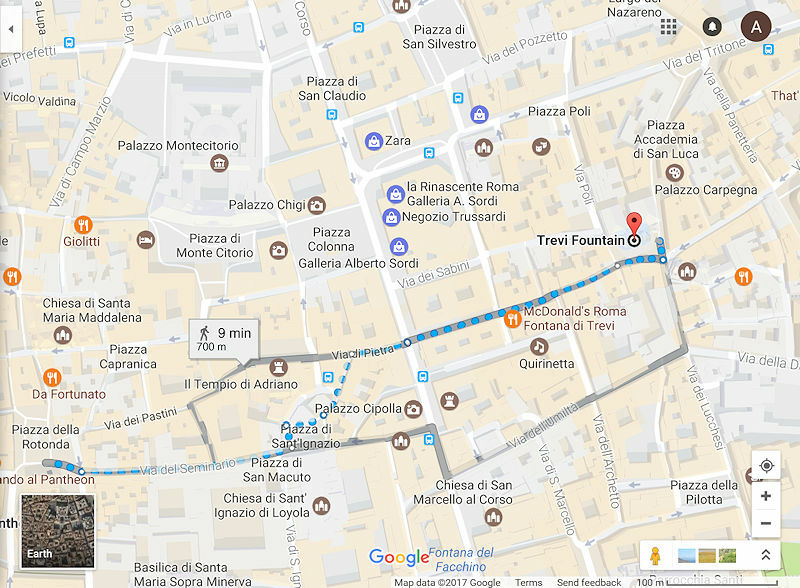 According to Google maps, it was about a ten minute walk, but it did not feel that long. The best part about the Trevi Fountain is the arrival, in my opinion. It's not set back in a gigantic square but rather tucked onto a street that vehicles can't fit into. One second we were walking down an alley, the next second we could hear water and lots of people talking, and then another ticks by and BAM! There it was. Right in front of us. I loved the Trevi Fountain. My second favorite part of Rome. My goodness, the pastries in Rome were like nothing else. 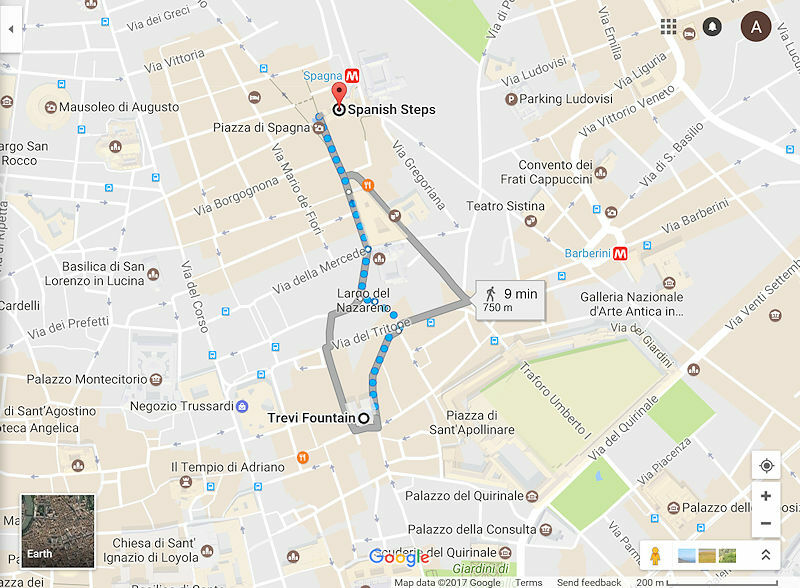 Relying on my trusty Google maps again, it claims the Spanish Steps was even closer to the Trevi Fountain than the Pantheon. I believe it. Then again, I had cannoli in my stomach and a roasted chestnut my father in-law had picked up from a street vendor filling my belly, so really I was just floating along. The Spanish Steps were neat. I will admit, I know absolutely nothing about them or their historical value, but I did appreciate getting to climb to the top and enjoy the view. Following the Steps was a lunch at one of the hundred restaurants located off the side streets. The server gave Alex a hard time for wanting Fettuccine Alfredo (I guess that's an American thing) and I got some delicious Quattro Formaggi pizza. 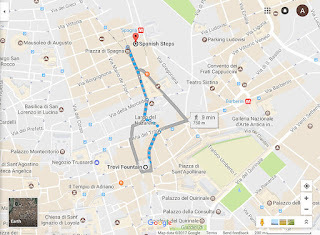 After lunch we strolled back to our tram stop, which was located right on the other side of the Piazza del Popolo, which was a pretty cool area. The Fountain of Neptune was one of my favorite statues that I came across while walking the city. At this time, my group did decide to split up. Alex and I took the kids home and to the park, because Landon was having a bit of a rough day. As parents, we knew he needed some time to decompress and break away from touring. Meanwhile, the rest of the adults went to the Borghese Gardens. Alex and I fed the kids an easy dinner in the apartment and put Evie to bed. Shortly before 8 o'clock, we left Landon in the care of the grandparents and the two of us - along with my sister in-law and her boyfriend- went out for an adults-only evening in Rome. I'm going to sound like a terrible parent, but it was my favorite part of the trip. The four of us wandered around until we found a place to eat. The food ended up being mediocre, which was a shame, but we all enjoyed some alcoholic beverages and joked around about nonsensical things. There was a couple sitting next to us who kept staring at our table like we each had 8 heads. I won't lie, the less booze that were in our glasses, the louder we became, but we certainly weren't being disruptive or rude. Once dinner was over, we went to a bakery called Pompeii and got two orders of Tiramisu to share. If you ever go to Rome, you MUST get some of this tiramisu. It only costs 4 Euro and was the best one I had ever had. Alex, who's not a big fan of the dish, demolished his half before he even realized it. However, whatever you do, don't eat the tiramisu on the Spanish Steps. Otherwise, an undercover cop might come by and ask you to leave. This might or might not have happened to us. When two parents are out on a quasi-date in Italy, they don't just stop at one dessert. They go and hunt down the oldest gelato shop in Rome and get a few scoops to go! The best part about the gelato shop was getting to and from the building. The four of us strolled through alleys and quiet streets, enjoying the nighttime sounds of the city. Rome at night had a different feel about it. The noise was quieter, everything moved a little slower, all the tourists seemed to want to savor the minutes more than in the daytime. I really felt like I was experiencing Italy that night. There weren't as many peddlers hounding us to buy selfie sticks, the sidewalks were breathable, and the smells of wine and homemade pasta scented the air. After our two desserts (DON'T JUDGE) we all went back to the Trevi Fountain to experience it at night. And I gotta say, I loved it even more in the dark. I made Alex sit down next to me on one of the benches and relax for a bit. The Fountain was our final stop of the night. While the wife and twenty something year old in me could have stayed out hours later, the mother and vacationer knew I needed to get back and grab some sleep. 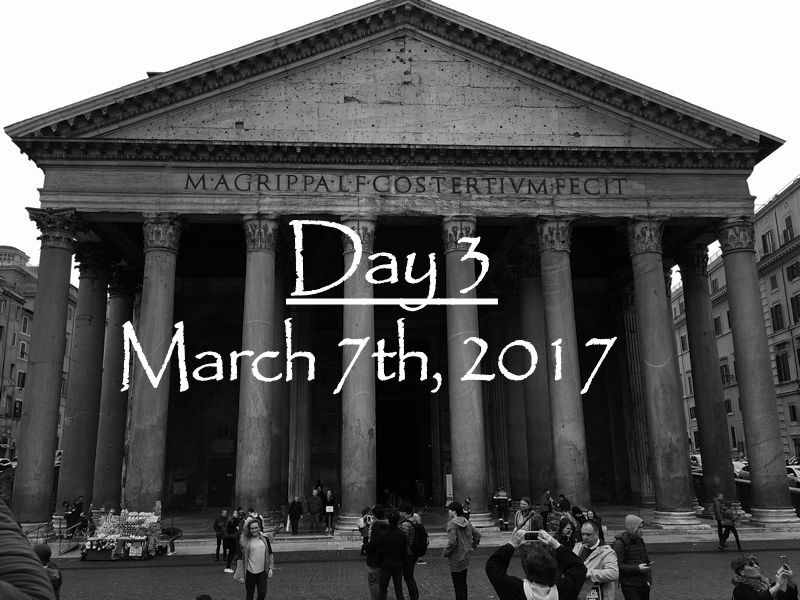 Our final day in Rome was fast approaching, and we had Alex's Must See planned.